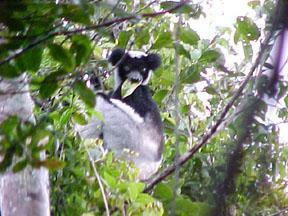 "May I announce to you that Madagascar is the naturalist' promise land? Nature seems to have retreated there into a private sanctuary, where she could work on different models from any she has used elsewhere. There you meet bizarre and marvelous forms at every step." Although greatly changed by man since 1771, Madagascar remains a truly wonderful country with unique wildlife, bizarre plants, superb climate, and the nicest people you will find anywhere. Even the cities and towns are fascinating, thanks to some inspired architecture and the Malagasy love for flowers, music, and warm colors. 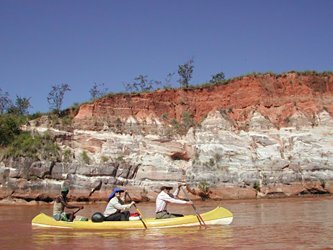 If you like camping, wild natural places, and exercising in gorgeous weather, then you will love a Madagascar river trip. Paddling takes you at a pace that allows you to take it all in and truly enjoy the tranquility of your surroundings. 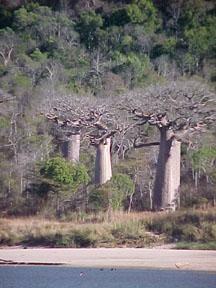 Floating through most probably the greatest collection of baobab trees found on the planet, the majestic Mangoky River in south-western Madagascar is a truly remote and wonderful river experience. Our multi-activity program gives us exposure to a variety of ecosystems. Along with 7-days calm water rafting on the Mangoky River the program includes: Andasibe-Mantadia (Perinet) in the eastern rainforest; spiny forest of the southwest; beach & reef diving in Ifaty; Kirindy Forest Reserve; Avenue of the Baobabs and the tranquil coastal town of Morondava. Explore the "Wonders of the West"! 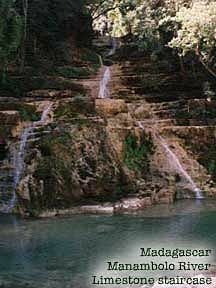 A wonderful way to reach the Tsingy de Bemaraha is by floating down the tranquil Manambolo River. Features include Andasibe (Perinet) National Park, the Kirindy Forest, Ave of the Baobabs and the Chez Maggie Hotel on the coast in Morondava. And a sampling of eastern rainforest.